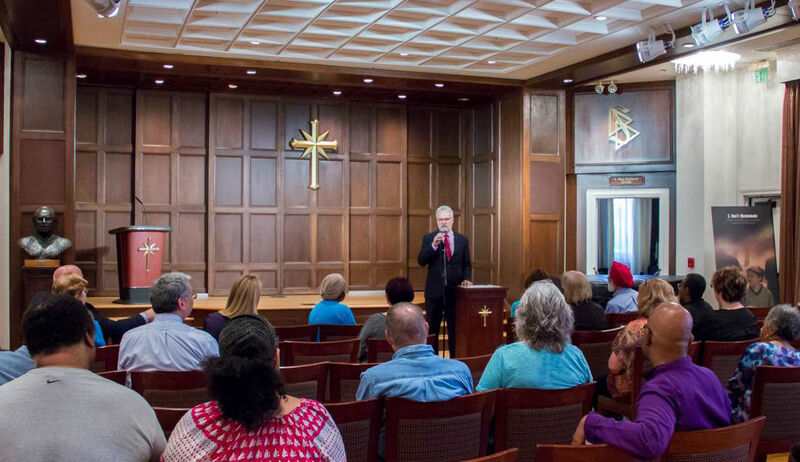 Tennessee United for Human Rights held a large interreligious, multicultural event for International Peace Day at the Church of Scientology community hall. International Day of Peace was declared by the United Nations General Assembly as a day devoted to strengthening the ideals of peace, both within and among all nations and peoples. In Nashville, each year, International Day of Peace has been observed with a different theme related to the Universal Declaration of Human Rights. Tennessee United for Human Rights (TUHR) promotes human rights education to combat ignorance and make peace a reality by increasing awareness of human rights. In this 70th anniversary year of the Universal Declaration of Human Rights, TUHR brought together people of many faiths to share words of peace. “I am proud that we were able to bring together a multicultural, multifaith community of people who could speak about peace on a human level,” said Rev. Brian Fesler, pastor of the Nashville Church of Scientology and regional coordinator for Tennessee United for Human Rights. Religious traditions represented included Baha'i, Baptist, Hare Krishna, Jewish, Church of Jesus Christ of Latter-day Saints, Presbyterian, Sikh, Unity and Scientology. As reflected in the religious readings presented by the many religious leaders participating in the program, peace is a unifying message shared by all. TUHR is a chapter of United for Human Rights, formed on the 60th anniversary of the Universal Declaration of Human Rights to provide human rights resources and educational materials to all sectors of society. For more information about Peace Day or human rights, visit the website of Tennessee United for Human Rights of United for Human Rights.